There is no truth to the claim that high salt intake is unhealthy. 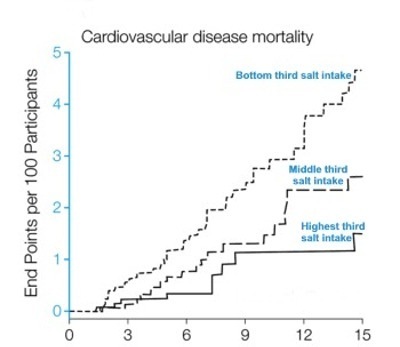 In fact, evidence shows the opposite to be true: Low salt intake is associated with the highest cardiovascular death rate and the lowest cardiovascular death rate is associated with the highest salt intake. Modern medicine has it wrong—dead wrong. Forget all those claims that you need to keep your salt intake low to maintain heart health. It isn’t true. Those claims have been based on deeply flawed studies and the medical establishment’s enforcement of lock-step obedience to whatever the current orders happen to be. Right now, one of them is that lower salt intake is healthy for everyone. The reality is exactly the opposite for most people. The Journal of the American Medical Association (JAMA) is published a study of 3,681 people that correlated their salt intake with hypertension and cardiovascular disease and death. The results are clear: People with greater salt intake have significantly less heart disease and death from it. Notice that forcibly lowering blood pressure is not beneficial to health, though that claim is also routinely made. As the JAMA study shows, a slight decrease in blood pressure occurs with lowered salt intake; it’s nominal and entirely unrelated to outcomes. Take a look at the graph to the left. It clearly shows the difference in death rates. The subjects were placed into three groups according to salt intake, and the number of cardiovascular deaths per hundred subjects was graphed. Clearly, the cardiovascular death rate is far lower in the people with the highest salt intake. Notice also that, as time goes on, the distinction in cardiovascular death rates between the lowest and highest salt users increases. The study, entitled “Fatal and Nonfatal Outcomes, Incidence of Hypertension, and Blood Pressure Changes in Relation to Urinary Sodium Excretion”, did not suffer from the common flaws of many, if not most, medical studies. It wasn’t financed by Big Pharma. None of the authors received money from Big Pharma or industries related to the topic studied. There were no ghost authors; the researchers who drafted the manuscript are specified. The researchers named first and last in the credits, Katarzyna Stolarz-Skrzypek, MD, PhD and Jan A. Staessen, MD, PhD for the European Project on Genes in Hypertension, were both the research leaders and the actual authors. How Are Estimates of Death Rates from Salt Intake Generally Made? Of course, we’re all aware of just how consistently we’re told that lower salt intake improves heart health. But how do you suppose they come up with the estimates that supposedly prove it? It’s done by magic, of course! As the study’s authors point out, presumptions are fed into computer models, which grind out predefined results of “lives saved”. The claims are based on bits being tossed around inside computer chips, not on real-life data. They’ve shown that salt puts up blood pressure, and yet they then claim that salt relates inversely to events. Well, that doesn’t make sense…[It illustrates] the bias of the authors, in my view. Everything else that has been shown to lower BP is beneficial in terms of heart attacks and strokes. I really don’t think this is worth paying attention to. They are trying to create a stir. This is clever, but it’s harmful in my view. It’s like saying we don’t think cigarettes are harmful so we shouldn’t do anything about smoking. The overall evidence [in favor of salt reduction] is overwhelming. That isn’t to say we wouldn’t change our mind if we had really good evidence, but I don’t think this is it. This will not divert us from reducing salt intake worldwide. At a high-level meeting of the World Health Organization, salt reduction has been recommended as the next thing after tobacco reduction because it’s so cost-effective to implement and so easy to do. MacGregor uses typical methods of obfuscating. He attacks the quality of the study, but offers little to support his assertion. He makes sweeping claims without supporting them. He then falls back on one of the grand standards for those who don’t really have good evidence to support their contentions: They make clear that their view is the popular one. In the end, MacGregor states that, even if the study were “perfectly done” it wouldn’t make any difference, because there are so many that support his point of view. What he doesn’t mention is how deeply flawed those studies are. Careful analysis of most of those studies shows that they tend to cherry-pick data, while meta analysis of the data itself shows the same results as this study. The danger inherent in rigidly held beliefs by entrenched health powers is clearly revealed here. Modern medicine’s focus on treating disease, rather than on maintaining health, has resulted in promotion of many false claims, with obvious negative effects on the well-being of people. It has become virtual heresy to suggest that any claims by modern medicine are incorrect. It’s so ingrained that even alternative medicine often follows the pack, as in the advice to lower salt intake. And now, we have governments enforcing these false claims. Salt reduction is being enforced in the food industry. Schools are reducing salt in lunches—and some schools are forcing children to eat their lunches instead of bringing them from home. There is now an industry in place to push people into consuming less salt. Don’t expect the results of this study to have any effect on what modern medicine or their cohorts in crime, governmental agencies, do regarding salt recommendations. Too much is riding on them. Reputations of doctors and high-ranking government officials could be harmed if the truth were acknowledged. The waste of massive amounts of the public’s money in promoting lower salt intake would betray the political health of elected officials. In that world, the actual health of the people carries little weight. As a result, any pseudo-study that promotes the approved doctrine is pointed out as “proving” the official proclamation. Any honest study that demonstrates the truth is quickly ridiculed, condemned, and then quietly swept under the rug. Humans have understood the value of salt since humans have existed. It was traded among the earliest communities on earth—likely back in the times of cave dwelling. We use expressions like “salt of the earth” because of that recognition of its value. Only in modern times, with science corrupted by corrupted medicine and government, is salt treated as our enemy. Listed below are links to blogs that reference this entry: Heart Disease Deaths 5 Times Higher with Low Salt: JAMA Study. This page contains a single entry by Toni published on April 22, 2013 3:53 PM. Oral Probiotic Reduces Ear and Throat Infections in Children and Adults was the previous entry in this blog. 7 Ways To Prevent and Even Reverse Heart Disease With Nutrition is the next entry in this blog.